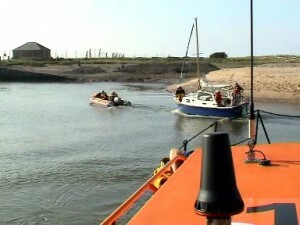 The ILB had already launched to assist the 38′ Morecambe bay prawner “Polly” which had engine problems 5 miles North-West of Rhyl, on passage from Rhyl to Conwy marina. The ILB had tried to tow the boat, but was only managing to hold the boat head to sea due to it’s size and weight. The AWB therefore launched and took up the tow. This was achieved by 1210, and the ILB returned to station. The tow was continued until the entrance to the River Conwy was reached. 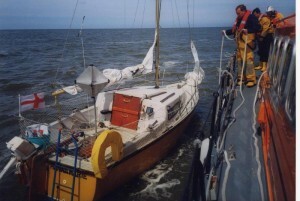 The AWB then went to anchor as it was not possible to enter the harbour, as the casualty had a 4′ 8″ keel. The tow was re-commenced at 15.30 and the boat was safely alongside the visitor’s moorings in Conwy Marina at 16.30. The AWB returned to station, and the boat was ready for service by7 19.00.This was the same boat we towed into Rhyl in November last year. The ILB had launched to go to the aid of a small day boat called “Gemill” with 3 persons on board, whose outboard engine had broken down. The ILB went alongside and called for the assistance of the AWB to tow the boat from Llanddulas to Rhos-on -sea. 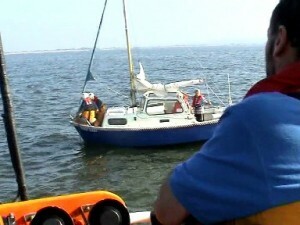 Once the tow was taken over, the ILB was released and the Boat was left on a mooring at Rhos On Sea . As the Lifeboat was leaving Rhos harbour, Holyhead coastguard reported a speedboat with 5 persons on board, in difficulty off the Little Orme, Llandudno. The lifeboat set off, and located the speedboat being towed by another larger power boat. The tow was transferred to the Lifeboat, and a woman and small child were transferred onto the Lifeboat. The boat was towed back to Rhos on sea, where 2 crew members went onto the speedboat, to assist with the recovery on to the slipway. the 2 crew were then put back on to the Lifeboat and it returned to Rhyl by 1820. Holyhead Coastguard requested the launch of the AWB to investigate reports of a blue and white 18 foot speedboat off Llandulas, apparently with no persons on board, but with the engine down. The ILB also launched . Both boats arrived on scene to find a man and a boy fishing happily, they had been lying in the boat having their lunch!. Both boats then returned to station by 1400. The ILB was already on service towing the 18 foot yacht “Hanna Marie” out of the surf off Towyn. The skipper was on his own on the yacht, his family having been taken ashore by the ILB. As the boat had come from Rhos-On-Sea, and there was no water in Rhyl harbour, the AWB was launched to return the skipper and boat back to the trailer at Rhos. The AWB was alongside 5 minutes after launching, and took over the tow from the ILB, which returned to station. 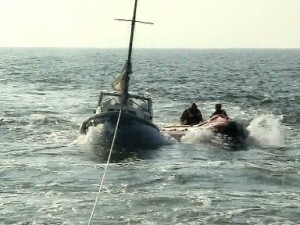 The tow took about 1 hour and the boat was transferred to it’s trailer by the lifeboat crew and the skipper by 1510. The AWB returned to station, being ready for service by 1700. AWB requested to launch to assist the ILB in searching for possible occupants of a dinghy found off Rhyl with an outboard engine on it. AWB search was called off when it was discovered dinghy had come adrift from Rhyl harbour the previous night. Photos available soon. AWB launched to support ILB to search for 2 children presumed missing from an inflatable dinghy 1/2 mile off Pensarn, Abergele. See ILB report for full details. AWB put on immediate readiness to assist ILB and police in Rhyl harbour with a man who had jumped into the harbour from the blue bridge. See ILB report for further details. AWB stood down at 0330. AWB put on immediate readiness to assist ILB with an inflatable dinghy with 2 persons on board, off Towyn. The ILB was able to cope with this incident and so the AWB was stood down at 1150. AWB crew paged to assist ILB and helicopters from RAF Valley, Anglesey and North Wales Police, in search for 2 children assumed fallen off inflatables off Kinmel Bay. See ILB page for more details. Nothing was found and the AWB returned to station at 1845. Holyhead Coastguard phoned the Lifeboat operations manager, who was at the boathouse, to say they had a report from the 28-feet long Snapdragon yacht “Herring Gull” to say they had incurred gear failure and a faulty engine, 1.5 miles off Rhyl. The AWB pagers were set off and the boat was launched at 0938. The Lifeboat was on scene within 8 minutes and talked to the skipper. 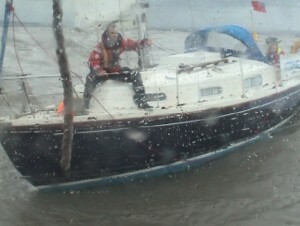 His lady crew was unwell, but a tow line was successfully passed at the first attempt. The wind was gusting to nearly 30 knots from the North, picking up the seas to about 2-3 metres breaking height. The skipper had not heeded the coastguards warning of poor weather and had set out from Anglesey t get to West Kirby on the Wirral. The tow was undertaken, and it was pretty hairy going across the entrance to the River Dee, with 4m standing cresting waves threatening to swamp the boat, but the drogue worked well, and the boat was off West Kirby by 11.30. The West Kirby ILB was launched to assist getting the boat on to his mooring, and all was well and the Lifeboat returned to Rhyl by 12.30. The skipper and crew were taken ashore at West Kirby by the ILB crew. Rhyl Lifeboat was ready for service by 14.00. This is a weird one to classify, but as the AWB was called to Immediate readiness, and because so many Lifeboat crew were involved, this will go down as an AWB service.4 Jet-skiers were reported overdue from Colwyn Bay. They were going to the windfarm, but had not returned as scheduled. Holyhead Coastguard requested the AWB be put on immediate readiness. As we were opening the front doors of the boathouse, we could see figures on the water’s edge, about 1 mile out from the boathouse.2 of the crew went down in the Land Rover and found 2 men with 4 jet skis. One of the jet skis had broken down off the windfarm, and they had managed to tow it as far as Rhyl but still had about 8 miles to go. 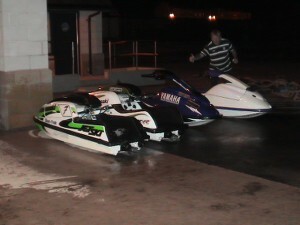 They had decided 2 of their party should get back to their vehicles by land and return to pick up the skis. The crew stated it would be difficult for a vehicle to navigate the sandbanks without knowledge, and so the whole assembled crew hitched the recovery trailer to the County tractor, and everyone else piled into the Landrover and set off down the beach. 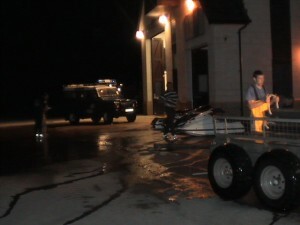 the 4 jet skis were recovered in 2 runs back to the boathouse, and about 20 minutes later, the other 2 men arrived in their vehicles. All were very grateful for our help, as they would have found it hard to recover the skis on a large rising and incoming tide. 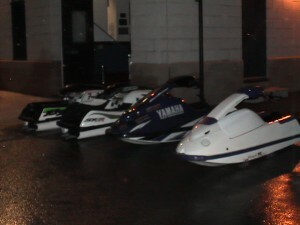 Pictures show the jet skis back at the boathouse. As the ILB was launching for another job, the coastguard at Holyhead phoned the boathouse, requesting the launch of the AWB to the 18-foot yacht “Linda Mary” with 2 persons on board, 1.5 miles north-west of Rhyl, who had suffered engine failure and could not get back to Rhyl harbour. The AWB was alongside within 12 minutes and towed the yacht to the harbour, where the ILB put the yacht alongside the quay wall. The AWB returned to station at 1730. Both AWB and ILB requested to launch to search for a 5-year old girl seen floating face downwards in the surf off Golden Sands Holiday camp, Towyn. RAF helicopter “rescue 122” and North Wales Police helicopter “NW1” were also tasked, together with local coastguard teams from Rhyl and Llandudno. An extensive search was undertaken between Abergele and Rhyl up to 2 miles out from the shore, but after 2 hours, nothing had been sighted. details of the child were scratchy, and as no person had been reported missing, the search was scaled down, terminating after 3 hours. The Lifeboats returning to station by 1500. Pagers set off by Holyhead coastguard after a member of the public reported 3 children in difficulties on inflatables off Kinmel Bay. The Operations manager contacted the coastguard, who at first requested the ILB, but due to gale-force winds, the AWB was then requested. The manager looked through the binoculars at the boathouse and could see that the children were now all ashore, so the launch was cancelled at 1140. AWB crew requested to come to immediate readiness after red flare reports off Point of Air at Talacre, about 7 miles to East of station. Rhyl and Flint Coastguard mobile teams were on scene and firing white parachute flares, with no response. With nothing being found after 20 minutes, all units were stood down. Both Rhyl and Llandudno Lifeboats were paged to assist the 2500 tonnes coaster “Arklow Freedom” who was 2 miles off Llandulas and had lost all motive power, and was dragging her anchors. she was drawing 2.5 metres and when Rhyl Lifeboat arrived on scene, the depth of water was 6 metres. 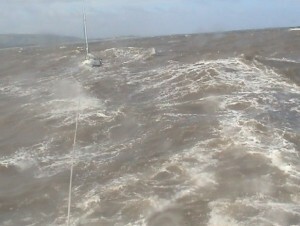 The wind was blowing 30.5 knots (force 8 gale) and seas were between 1 and 4 metres high. The wind was blowing West-North-West, and so there was no shelter. The skipper originally asked for 3 of his crew to be taken off, but it was agreed it was less hazardous for them to remain on board, rather than transfer to the much smaller Lifeboat. 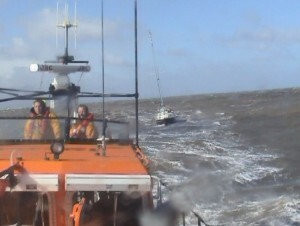 Rhyl and Llandudno Lifeboats therefore stood off the vessel whilst her crew started to fault the power control system. After about 2 hours, power was resumed, and the “Arklow Freedom” started to haul up her anchors. this was completed by 22.40 and so Rhyl Lifeboat was released from standby. The vessel then started making way to shelter off Moelfre in Anglesey, and was escorted until off Llandudno by Llandudno Lifeboat. Rhyl Lifeboat was ready for service by 00.02 and Llandudno by 00.50. I am unable to provide photographic documentation for this as I forgot the video camera!